So the sprouts are coming along, and I mentioned using sub-irrigation planters made of buckets on top of a raised grow bed. This was to combat the ants that have given me so much grief in the past. When I was at Lowe’s, I was re-designing the raised grow bed in my head yet again, I just couldn’t get over the cost of the buckets! About $190.00 new, or a lot of time and effort to pick them up used. I wanted to complete the grow bed this weekend! 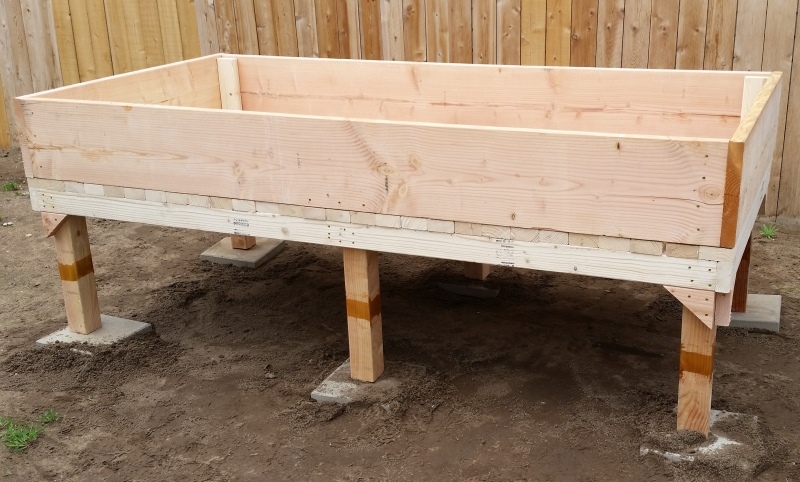 And then I realized, to make a grow bed, I only needed a grow bed – not buckets! I’ve used the Square Foot Gardening method before at the Cherry Plum house, and it worked great – except for the ants. I could do the same thing on top of the platform. Let’s see, the platform will be 4 feet by 8 feet, so I needed three pieces of 8 foot by 12 inch boards. This cost me $30.00 for those boards – MUCH cheaper than 64 buckets at $3.00 each! Here’s what the design looks like. First the bones made of the 2x4s and the 4x4s for the feet. As you can see in the completed build, I used 2x4s to strengthen the places where the 2x12s were joined at the corners. This is because 2x12s from big box stores tend to split down the length of the board – usually right in the center of the board. Almost every 2×12 I’ve purchased has done this. I guess builders are okay with this. I also used 2x4s to “tack” the 2x12s to the bed along the long and short ends of the board. So the first thing I did was put down 6 bricks on the Fresno hardpan dirt in my backyard. I leveled these bricks. Next I built the platform, and hauled it out to the bricks, and checked the level. This isn’t sufficient for a permanent installation – if I thought this was permanent, I’d put in real footings for the legs, and make sure that it will remain in place and level for the next 20 years or more. Instead, with Fresno hardpan, this is probably sufficient for the next 3-6 years, depending on rainfall. You can see from the stripe on each leg, that I’ve already applied Tanglefoot to the legs to deny those ants a highway to my crops! Next I added the 2x12s, and tacked them into place. I’m using 2 1/2 inch screws on any place that’s critical, like the joins and the places where I’ve tacked the 2×12’s. I attached the platform 2x4s to the platform using a nail gun. You can also see in this photo that I’ve increased the rigidity of the frame by adding triangular braces on the outside legs. In my last image, I’ve added an old tarp to the inside of the grow bed, and draped it over the outside. 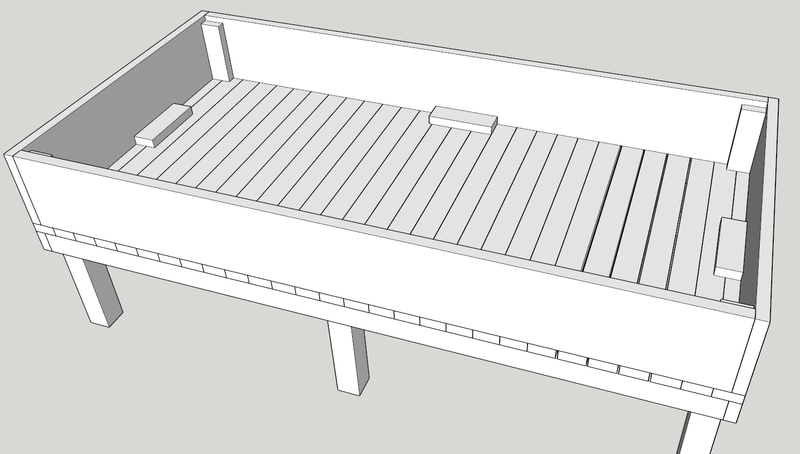 Mostly I want a way to keep soil and water in the grow bed, and prevent it from quickly leaking through the wood. It will still leak, but not until the tarp begins to fail, so not at all at first. 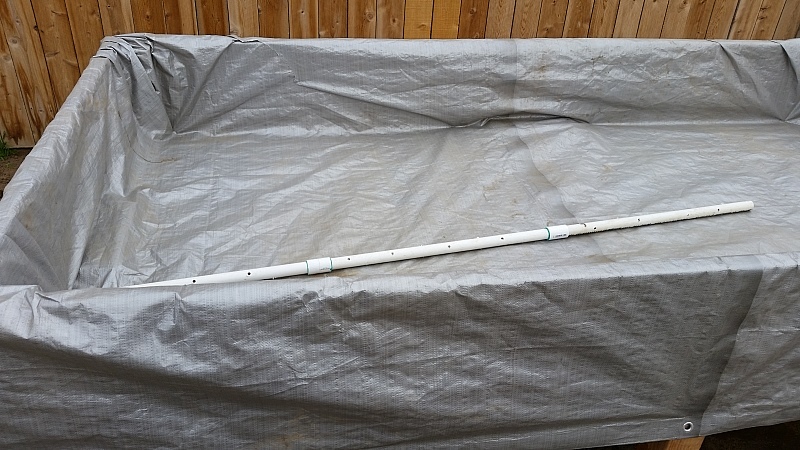 I also wanted a way to let everything drain, so I added a drain pipe to the bottom of the grow bed. This is just a few pieces of schedule 40 PVC that I had lying around my shop. I drilled holes in it, and stuck it through the side of the grow bed. I’m not sure if this is a good idea or not, but I’m going to try it!. So, how much weight can this thing hold? I’m going to be filling it with wet dirt after all! Well, each 4×4 post is a column that can easily support up to 7,000 pounds, or 42,000 pound in total over a balanced load. That leaves the 2×4 spans. Let’s see, a cubic foot of water weighs 62.4 pounds. A cubic foot of moist dirt is about 78 pounds. Let’s add over 20% “fudge factor”, and call it an even 100 pounds per cubic foot. The grow box is 1 foot high, by 4 feet by 8 feet, or 32 cubic feet total. So it may be possible that this grow bed is supporting 3,200 pounds of weight! The longest unsupported 2×4 span is 4 feet. And it is made of pine / spruce / fir. 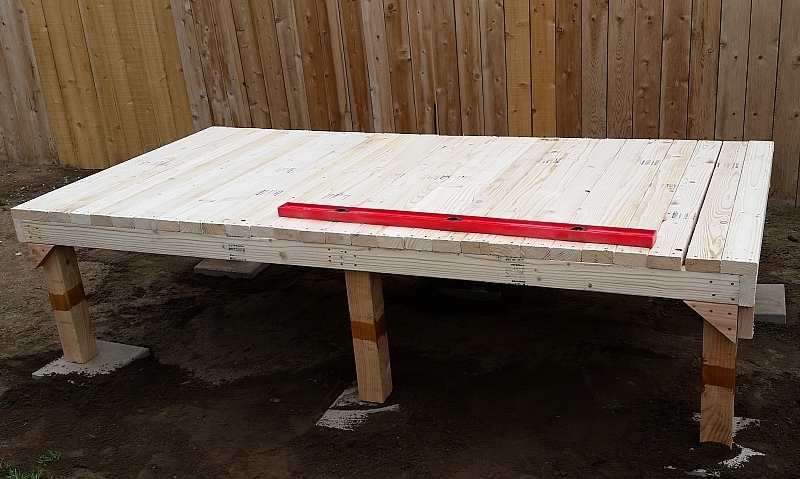 According to the MSR Lumber Producers Council span tables, a 100 psf live load on 2×4’s on 16 inch spacing a span of a little over 4 feet is safe. This is just for the 2×4 joists. 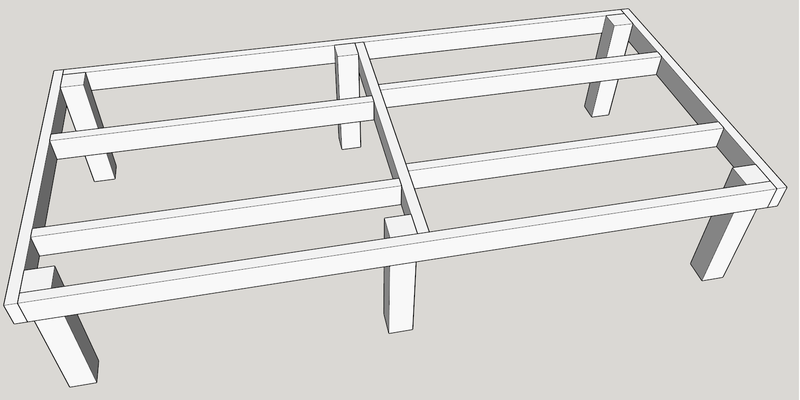 I also have 2×4 flooring that is supported by the joists and by the posts, so the distributed weight is better supported in some areas than others. But the whole structure will support the moist dirt plus fudge factor. What is really interesting is that if the dirt is washed out, and replaced with just water, the structure will actually lose mass and become lighter! So I’m not worried about the structure becoming too heavy in the rain, even if I didn’t have drainage! I filled in the grow bed with “Mel’s Mix” tonight, and finished doing so in the dark. So no pictures just yet. I’ll try to get them this week.